The purpose of this Environmental Monitoring and Audit (EM&A) Manual is to provide information, guidance and instruction to personnel charged with environmental responsibilities and undertaking environmental monitoring and auditing work during the Lamma Power Station Navigation Channel Improvement (the Project). It provides systematic procedures for the monitoring and auditing of potential environmental impacts that may arise from the works. As the total dredging volume exceeds 500,000m3, the dredging operation of the Channel improvement is a designated project according to the Environmental Impact Assessment (EIA) Ordinance. Schedule 2, Part I, C.12. The EIA report for the Project was prepared in response to the Environmental Impact Assessment Study Brief No. ESB-078/2001 issued by EPD on 23 July 2001. The EIA study concluded that no unacceptable or insurmountable impacts were expected from the proposed development, provided that the recommended mitigation measures in the EIA Report are adopted and implemented. This EM&A Manual was prepared as per the mitigation measures and environmental monitoring requirements recommended in the EIA report. The Hongkong Electric Company Limited (HEC) is proposing to improve the existing navigation channel in order to provide a safe shipping access to and from the Lamma Power Station. The work involves re-deepening the existing channel by dredging to a water depth of –16 mPD approximately with an estimated total dredging volume of 2.98 million m3. The Channel was first dredged to –15.9 mPD (approximately) in 1981. Maintenance of the Channel by means of dredging down to about –16.5 mPD level was carried out in 1989-1990. To cope with the updated vessel operation, the turning basin of the Channel was enlarged by extending 250m southward in early 2001. The Project Area is illustrated in Figure 1.1. 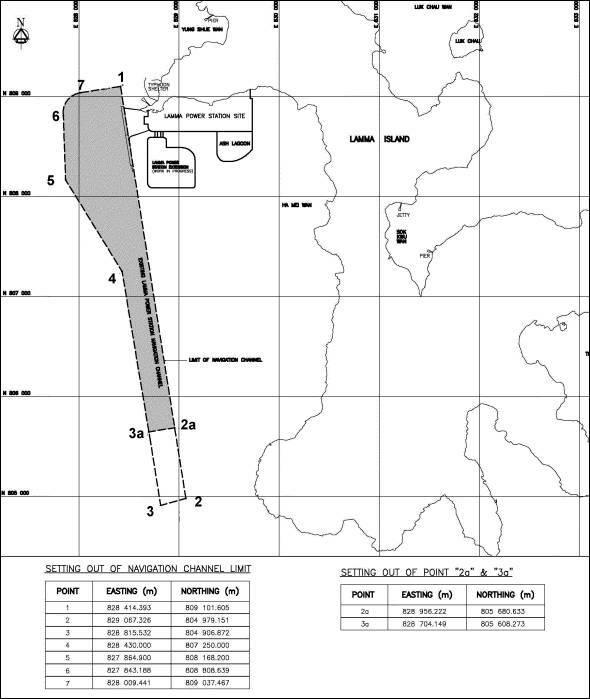 The grey area shows the limit of the Channel where dredging will be required under this Project. According to the latest bathymetric survey of the Channel, there is already sufficient water depth in the remaining section of the Channel in the south (beyond the grey area in Figure 1.1) and no dredging will be required. The dredging options for the Project are continuous dredging using grab dredgers with cage-type silt curtains or intermittent dredging using one Trailer Suction Hopper Dredger (TSHD). Either one of two dredging options will be deployed. The dredging work is tentatively scheduled to take place from May to December 2003. Marine vessels will transport the dredged sediments to the mud disposal sites approved by the Marine Fill Committee for disposal. The environmental impacts resulting from the Lamma Power Station Navigation Channel Improvement are studied and presented in the EIA Report. The Report also specifies the mitigation measures that need to be implemented to ensure compliance with the required environmental criteria; these mitigation measures and their implementation requirements are presented in the Implementation Schedule contained in Annex B of this Manual. The EIA Report recommends that environmental monitoring should be carried out for water quality. In addition, environmental audits for water quality and waste management issues are also required. This Manual provides specific details of the EM&A requirements that have been recommended to ensure compliance with the mitigation measures specified in the EIA Report. · provide data against which environmental audits may be undertaken. - to advise the site staff of any identified potential environmental issues. · submit regular EM&A reports which summarise project monitoring and auditing data, with full interpretation illustrating the acceptability or otherwise of any environmental impacts and identification or assessment of the implementation status of agreed mitigation measures. · Section 7 details the EM&A reporting requirements. In addition, Annex A provides samples for EM&A Reporting Documentation, and Annex B presents the summary of mitigation measures recommended in the EIA Report in the form of an Implementation Schedule. The Project requires that the Engineer appoint an Environmental Team (ET) before the commencement of construction of the Project. The roles of the ET are to conduct the monitoring and auditing works and to provide specialist advice to the Engineer on the undertaking and implementation of his environmental responsibilities. The ET shall have previous relevant experience with managing similarly sized EM&A programmes and the Environmental Team Leader (ET Leader) shall be a recognised environmental professional, who has at least seven years relevant experience in environmental monitoring and auditing or environmental management. To maintain strict control of the EM&A process, an independent environmental consultant shall be appointed to act as an "Independent Environmental Checker" (IEC) before the commencement of construction of the project. The IEC is to verify and validate the environmental performance of the Contractor and the Environmental Team. The IEC shall have at least seven years’ experience in EM&A or environmental management. The Chief Engineer (Projects) (thereafter called CE(P)) is the official contact person between EPD and HEC. CE(P) shall be authorized to sign all submissions to the EPD in accordance with the requirements of the EM&A Manual. The Engineer of HEC shall appoint appropriate members of the Project and resident site staff to manage and supervise the work of the Contractor, the Environmental Team (ET) Leader and its various specialist teams and other professional delegates. An Environmental Team will be established in-house to implement the environmental monitoring work as required by this EM&A Manual. An Independent Environmental Checker (IEC) will be appointed by HEC to audit and verify the overall environmental performance of the construction site and assess the effectiveness of the ET. 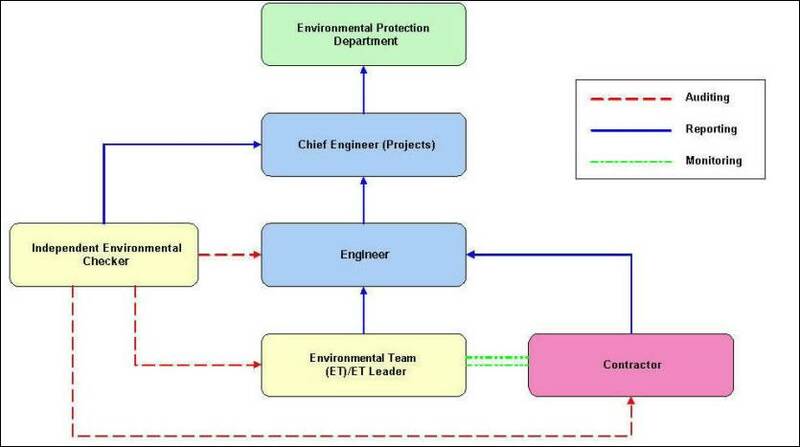 The organisation and management structure for the EM&A programme is illustrated in Figure 2.1. The specific roles and responsibilities of the various parties involved in the EM&A process outlined above are further expanded upon in the following sections. · take responsibility and strictly adhere to the guidelines of the EM&A programme and complementary protocols developed by their project staff. · instruct the Contractor to follow the agreed protocols or those in the Contract Specifications in the event of exceedances or complaints. · certify if necessary any additional mitigation measures or alternative measures that are required to be undertaken by the Contractor as the corrective actions to prevent adverse environmental impact arising from the Project. · check complaint cases and the effectiveness of corrective measures implemented by the Contractor and the ET in case of Action/Limit level exceedance. The project programme would tentatively commence in May 2003. The duration of the project would be about eight months. The main activity for the project is dredging. Marine vessels will transport the dredged sediment to the mud disposal sites approved by the Marine Fill Committee of the Civil Engineering Department. In this section, the general requirements of the EM&A programme for the Lamma Power Station Navigation Channel Improvement Project are presented. The recommended mitigation measures and schedule for their implementation are detailed in Annex B. The environmental issues associated with the Project which were identified during the EIA process will be addressed through the monitoring and controls specified in the EM&A Manual and contract. Using the Lamma Channel Model constructed from the Lamma Power Station Extension EIA, the potential WQ impact of the proposed dredging works in terms of SS levels has been assessed. The elevation of the SS levels in the identified Sensitive Receivers is a deciding factor of the maximum dredging rates for the two dredging options. The releasing potential of the contaminants in the seabed sediment has been ascertained from a purpose-designed Elutriation Test. The WQ parameters examined include nitrogen nutrients, sediment oxygen demand, heavy metals and micro-pollutants. For nitrogen nutrients and sediment oxygen demand, the resulting pollution elevation or oxygen depletion modelled was compared to the relevant WQOs. Provided the dredging rates do not exceed the recommended maximum rates, the SS elevation and oxygen depletion will not lead to non-compliance with the local WQOs at all the WQSRs except in the very vicinity of the dredging locations. Currently there is no statutory WQ standard for Hong Kong’s marine environment in terms of heavy metals or micro-pollutants. The predicted elevation of the heavy metals and micro-pollutants in the receiving waters has been compared to the standards in the EU, UK, USA and Japan. The increase in those pollution levels resulting from the proposed Channel Improvement at the recommended maximum dredging rates is well below the lowest values of the international standards reviewed, and is not considered to be of any concern. At the recommended maximum dredging rates, the sediment deposition rates are predicted to be less than 0.01 kg/m2/day along the west coast of Lamma Island and less than 0.001 kg/m2/day in the proposed South Lamma water for both dredger options. These figures are well below the level of any ecological concern. In view of the importance of the dredging rates in controlling WQ, the channel would be divided into four working zones for dredging. Each one has its own maximum dredging rate for wet and dry seasons respectively (Annex B, Table B2 & Figure B2). If dredging work is carried out in more than one zone in any day, the lowest rate in the affected zones will apply for that day. The dredging rates for each working zones will be reported in the Monthly EM&A Report on a daily basis to ensure that the maximum dredging rates will not be exceeded. The reporting of daily dredging rates should indicate the type of dredgers used, i.e. grab dredger or trailer suction hopper dredger, and the respective sizes of grab dredgers used. No additional WQ mitigation measures are required as long as the maximum dredging rates for respective dredgers recommended in this EIA are not exceeded. Nevertheless, a comprehensive WQ monitoring (discussed in Section 4) will be carried out to verify the modelling predictions. Should the WQ monitoring during the construction work indicate that any exceedance of the WQOs is due to the dredging work, the maximum dredging rates would be reviewed. Literatures and studies on the marine and coastal ecology of the Study Area has been reviewed in detail for this EIA and supplemented with additional field surveys conducted on 10 December 2001. Of greatest importance are the coastal stretches and waters off southern-south western Lamma. The Finless Porpoise was considered to be the key species potentially affected both directly and indirectly by works given that the southern extent of the Study Area is considered to be an important habitat, particularly in the period from February to April. Corals in this area are extremely sparse and patchy and already showing signs of stress. Furthermore they did not support significant reef communities and are of low ecological value when put into the Hong Kong context. To protect the marine and coastal ecology, it is recommended that monitoring and audit focus on the source of the ecological impacts i.e. dredging works and their WQ impacts. By ensuring WQ does not exceed WQOs for the area then ecological impacts can be prevented. This can be accomplished through the water quality monitoring at the sensitive receivers around the study area. Details of the water quality monitoring will be discussed in Section 4. Further, to avoid disruption to the finless porpoise population in the southeastern coastal waters of Lamma Island, some mitigation measures as shown in Annex B would be adopted. An effective EM&A program through the on-site inspection will be formulated to ensure that the mitigation measures will be fully implemented. Hence, no ecological monitoring and audit is required. The environmental assessment of the Project predicted that the recommended dredging rates at various working zones would prevent exceedance of the Water Quality Objectives (WQOs). As the dredging works are short term, small elevations in SS across the study area are not expected to affect fishing activities. The mitigation measures as recommended in the Marine Ecology would also help to minimise the impacts on fisheries activities as well. In addition, an intensive monitoring of water quality around the study area will be used to verify EIA predictions. Details of water quality monitoring are discussed in Section 4. As the EM&A requirements for fisheries impact will be similar to those recommended in Water Quality and Marine Ecology, no specific EM&A programmes is required for fisheries. According to the EIA report, the noise impact of this Project on the NSRs is negligible and the cumulative noise levels are below the noise limits during normal working hours (07:00-19:00 on normal weekdays). The same conclusions apply to the restricted hours of 07:00-19:00 on holidays including Sundays and 19:00-23:00 on all days. The noise impact will also comply with the noise limit for the restricted hours of 23:00-07:00 on all days for the TSHD option and also for the grab dredgers option by scheduling the dredgers in working zones. As such, no noise monitoring for this project in particular is necessary. However, a daily logbook should be maintained to record the number and type of plants deployed for audit purpose. In case justified noise complaints are filed, a near-field noise monitoring programme for the dredgers will be called into action. This is to check if the sound power levels (SWL) of the dredgers comply with that stipulated in the CNP. Should the SWL of dredger exceed that quoted in the CNP, appropriate action would be taken to remedy the situation. The only source of waste generation is from the dredging works. It is estimated that a total of 2.98 million m3 of seabed sediment will be dredged from the Channel over a 8-month period from May to December 2003. The elutriation test results concluded in the EIA report have shown that the concentration of all heavy metals and organic micro-pollutants from the samples are below the level of concern. Therefore it is concluded that the impact from heavy metals and organic micro-pollutants leaking from dredging materials are of negligible quantities and will not be of any concern to the overall WQ. The dredged materials, classified as Category L suitable for open sea disposal by EPD (cf letter ref (23)in EP 60/GI/12-293 dated 22/8/2001), will be disposed of at designated marine dumping sites approved by the Marine Fill Committee of the Civil Engineering Department. The contractor would obtain a valid dumping permit from the Authority prior to the commencement of dredging work. Detail EM&A requirements on waste management will be discussed in Section 5. Based on the above summaries, the predominant environmental issues subject to EM&A are water quality and waste management. A broad description of the monitoring programme for these issues is provided in the following sections. The monitoring of the effectiveness of the mitigation measures will be achieved through this process as well as through site inspections. The inspections will include within their scope, mechanisms to review and assess the Contractor’s environmental performance, ensuring that the recommended mitigation measures have been properly implemented, and that the timely resolution of received complaints are managed and controlled in a manner consistent with the recommendations of the EIA. The monitoring of environmental impacts shall be carried out by the Environmental Team; the monitoring work will comprise water quality impacts at representative sensitive receivers or strategic locations in the vicinity of the works. The monitoring programme for the Project is presented in Sections 4. Proper waste management is also required to ensure that the contractor will follow the mitigation measures recommended in the EIA report. The specific requirements are presented in Section 5. · Limit Levels: statutory and/or agreed contract limits stipulated in the relevant pollution control ordinances, the Hong Kong Planning Standards and Guidelines (HKPSG) or Environmental Quality Objectives established by the EPD. If these are exceeded, works should not proceed without appropriate remedial action, including a critical review of plant and working methods. The purpose of the Event and Action Plans (EAPs) is to provide, in association with the monitoring and audit activities, procedures for ensuring that if any significant environmental incident (either accidental or through inadequate implementation of mitigation measures on the part of the Contractor) does occur, the cause will be quickly identified and remedied, and the risk of a similar event recurring is reduced. This also applies to the exceedances of A/L criteria identified in the EM&A programme. In addition to monitoring water quality levels as a means of assessing the ongoing performance of the Contractor, the ET shall undertake regular site inspections and audits of on-site practices and procedures. The primary objective of the inspection and audit programme will be to assess the effectiveness of the environmental controls established by the Contractor and the implementation of the environmental mitigation measures recommended in the EIA. Whilst the audit and inspection programme will undoubtedly complement the monitoring activity with regard to the effectiveness of water quality control, the criteria against which the audits shall be undertaken shall be derived from the clauses within the Contract Documents which seek to enforce the recommendations of the EIA and the established management systems. The findings of site inspections and audits shall be made known to the Contractor at the time of the inspection to enable the rapid resolution of identified non-compliances. Non-compliances and the corrective actions undertaken shall also be reported in the monthly EM&A Reports. Section 6 of this Manual presents details of the scope and frequency of on-site inspections and defines the range of issues that the audit protocols should be designed to address. Enquiries, complaints and requests for information can be expected from a wide range of individuals and organisations including members of the public, Government departments, the press and television media and community groups. All enquiries concerning the environmental effects of the works, irrespective of how they are received, shall be reported to the Engineer and directed to the Contractor where necessary. The detailed complaints handling procedure is presented in Section 6.3. Monthly reports shall be prepared by the Environmental Team and verified by the Independent Environmental Checker. The monthly reports shall be prepared and submitted within 2 weeks of the end of each calendar month. Additional details on reporting protocols are presented in Section 7. The EM&A work will be reviewed taking into account the experience gained and the actual environmental conditions as and when required. The ET shall continue to carry out EM&A work until the completion of the navigation channel improvement works. In this section, the requirements, methodology, equipment, monitoring locations and mitigation measures for the monitoring and audit of water quality impacts from the Project are presented. Based on the recommendation in the EIA report, marine water quality monitoring shall be carried out to ensure that any deteriorating water quality is readily detected and that timely action is taken to rectify the situation. The appropriate water quality mitigation measures are outlined in the Implementation Schedule (in Annex B of this EM&A Manual). · special phenomena and work activities at the site. A sample monitoring record sheet is shown in Annex A. · a temperature of 0 - 45 degrees Celsius. It shall have a membrane electrode with automatic temperature compensation complete with a cable of not less than 25 m in length. Sufficient stocks of spare electrodes and cables shall be available for replacement where necessary. (For example, YSI model 59 metre, YSI 5739 probe, YSI 5795A submersible stirrer with reel and cable or an approved similar instrument). Turbidity within the water shall be measured in-situ by the nephelometric method. The instrument shall be a portable, weatherproof turbidity-measuring unit complete with cable, sensor and comprehensive operation manuals. The equipment shall be operated from a DC power source, it shall have a photoelectric sensor capable of measuring turbidity between 0 - 1000 NTU and shall be complete with a cable with at least 25 m in length (Hach 2100P or an approved similar instrument). A portable, battery-operated echo sounder approved by the authority shall be used for the determination of water depth at each designated monitoring station. This unit shall either be hand-held or affixed to the bottom of the work boat if the same vessel is to be used throughout the monitoring programme. A portable salinometer capable of measuring salinity in the range of 0 - 40 ppt shall be provided for measuring salinity of the water at each monitoring location. A portable pH meter shall be provided for measuring pH of the water at each monitoring location. A water sampler, consisting of a transparent PVC or glass cylinder of not less than two litres which can be effectively sealed with cups at both ends, shall be used (Kahlsico Water Sampler 13SWB203 or an approved similar instrument). The water sampler shall have a positive latching system to keep it open and prevent premature closure until released by a messenger when the sampler is at the selected water depth. Water samples for SS measurements shall be transferred directly to high density polythene sample bottles, packed in ice (cooled to 4 O C without being frozen), and delivered to a HOKLAS laboratory as soon as possible after collection. Should changes to the sampling equipment be required, approval from EPD should be sought prior to their implementation. A hand-held or boat-fixed type Global Positioning System (GPS) Receiver shall be used during monitoring to ensure the monitoring vessel is at the correct location before taking measurements. (a) All measuring equipment shall be checked, calibrated and maintained at intervals as recommended by the equipment manufacturers throughout all stages of the monitoring programme. (b) Sufficient stocks of spare parts shall be maintained for replacements when necessary. Backup monitoring equipment shall also be made available so that monitoring can proceed uninterrupted even when equipment is under maintenance or calibration. All laboratory work shall be carried out in a HOKLAS accredited laboratory. Water samples of about 1,000 mL shall be collected at the monitoring and control stations for carrying out the laboratory determinations. The determination work shall start within 24 hours after collection of the water samples. The analyses shall follow the standard methods according to Table 4.6a and as described in APHA Standard Methods for the Examination of Water and Wastewater, 17th Edition, unless otherwise specified.